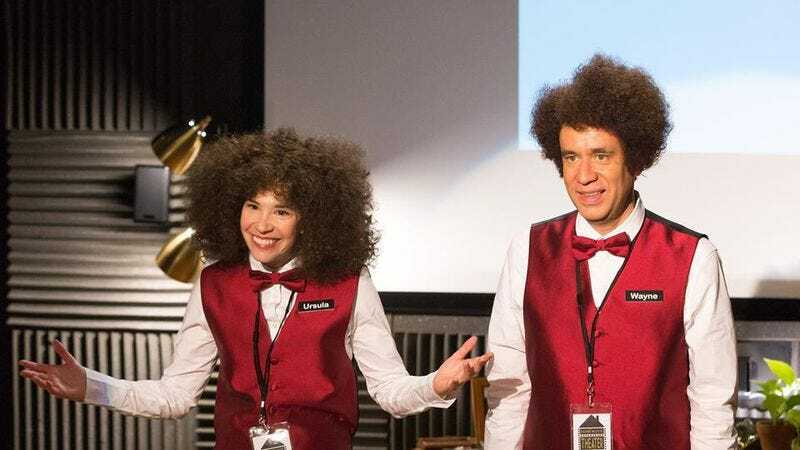 Through the course of its seven seasons, Portlandia has proven itself to be quite adept at skewering the mundane inconveniences of modern life. This could mean the people we force ourselves to talk to, or the endless mixed blessing that is modern technology. Either way, it’s one of the shows biggest strengths, and that skill was on full display in “Amore,” which is easily the strongest episode of the current season. The cold opening focuses on a new app that allows people to easily navigate through an office building. Basically, it’s a GPS for the indoors. As someone who is frequently absent-minded and gets turned around, this idea seems like a lifesaver. The premise is taken to its logical extreme, as it goes so far as to even point out where a toilet is within the bathroom. Taken to the next level, the app is also able to tell someone when their life is in a rut, and remind them to shake their employer’s hand after being offered a job. The premise is taken to an absurd level, but if we’re being honest, it could actually be used pretty effectively in the real world. Our made story thread focuses — as it often does — on Fred’s dating life. After a potential hookup is blown by a mutual inability to find adequate parking, he becomes desperate to meet a woman, and he signs up for an arranged marriage service. After noticing how close Fred is with his mother, the agency sets Fred up with an older Italian woman played by Rachel Dratch, who in absolute peak form here, bringing the same manic brilliance she did to so many characters on Saturday Night Live and 30 Rock. After first, Fred and Josephina don’t bond all that well, as they seem to have very little in common. In time, however, he begins to appreciate her eccentricities while also developing a fondness for Italian music. Their bonding is surprisingly heartwarming, especially for a show that can usually be somewhat cynical when looking at love. Elsewhere, we get a short-but-amusing bit about a loner who comments “beautiful,” on every picture he comes across on an Instagram-like service. The sketch has a simple idea, but it doesn’t overstay its welcome. Later, the character makes a return appearance over the end credits in a bit reminiscent of the classic “you’re cut” gag from The Simpsons. The strongest sketch of the night focuses on a movie theater that wants to make the experience as similar to watching a movie at home as possible. Seats are replaced with couches, people are given iPads so that they can ignore the movie, and the theater only shows the first half of Ferris Bueller’s Day Off because it’s probably been a long time since you saw the first half, and they want to keep it that way. This was an adroit skewering of all the gimmick-y theme-type places that you often see popping up, but in an amusing twist, the theater seems to be a success, as by the end of the night, everyone starts making out. Finally, Fred gives his best performance of the night as “The Safe Bully,” who is brought in by a school after a PTA meeting where parents complain that their children don’t have enough grit. He picks on kids, but also helps them up, and even offers them food when they don’t have any lunch money. It’s a lot of cognitive dissonance for the children, but it ultimately works, as within three days, they gain the courage to stand up to him, and his work is done. Amusingly, the parents now complain that their children have too much grit, and they can no longer tell them what to do. I’d have to imagine that any educator who frequently gets unrealistic requests from parents was nodding in agreement. Really, every single sketch worked here, and for the first time all season, Portlandia turned out a consistently great episode. “Amore” gave us the show’s signature observational humor while also injecting some rare emotion into Fred and Josephina’s plot. Up until now, Season 7 of Portlandia had been solid but perhaps a tad underwhelming. Tonight’s episode served notice that the show still has a little greatness left in the tank. -I have to wonder what noted grit-enthusiast PFTCommenter would have thought of The Safe Bully. Was he not gritty enough? Should he have been played by Danny Woodhead or David Eckstein. ?-Worth noting, this was the show’s least political episode of the season. The MRAs were absent, and none of the sketches showed much of the show’s trademark feminism. It’ll be interesting to see what they do going forward, and whether or not they’ll address Trump.